Pedion: Less than 20 hours left, and even more Free stuff and Tile types available! Less than 20 hours left, and even more Free stuff and Tile types available! Now its free Wall pieces for everyone, Urban and Sea/Coastline Tiles! This Kickstarter keeps surprising me, humbling me and my family over the support of the backers. Just a few hours after the previous blog post, the next Stretch Goal was reached! 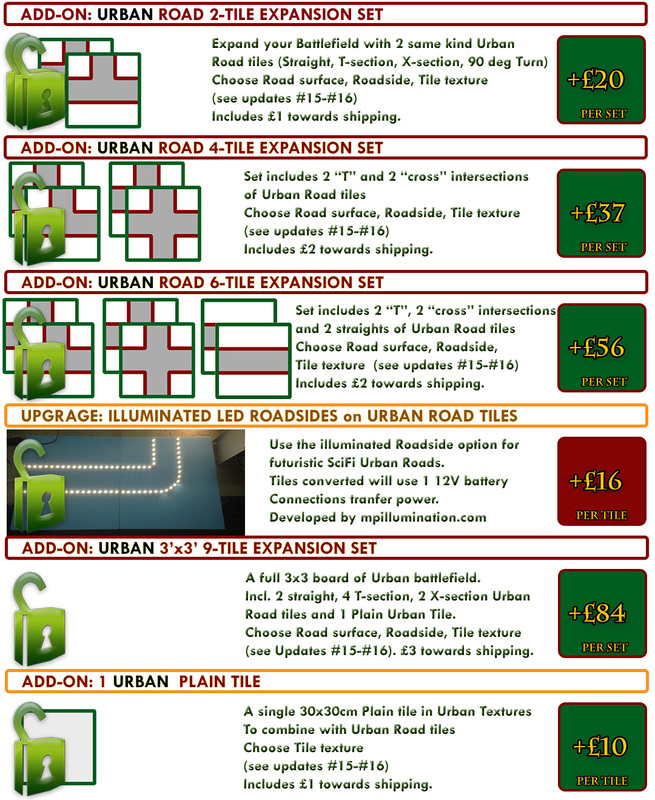 So you may now add Urban/SciFi/Modern tiles for your buildings and city fights, with magnetic tile surfaces! To the existing 7cm Road width there will be another width added, 14cm; Such a wide road can easily be considered a double-lane road at 28-32mm or a 4-lane highway in 15mm. 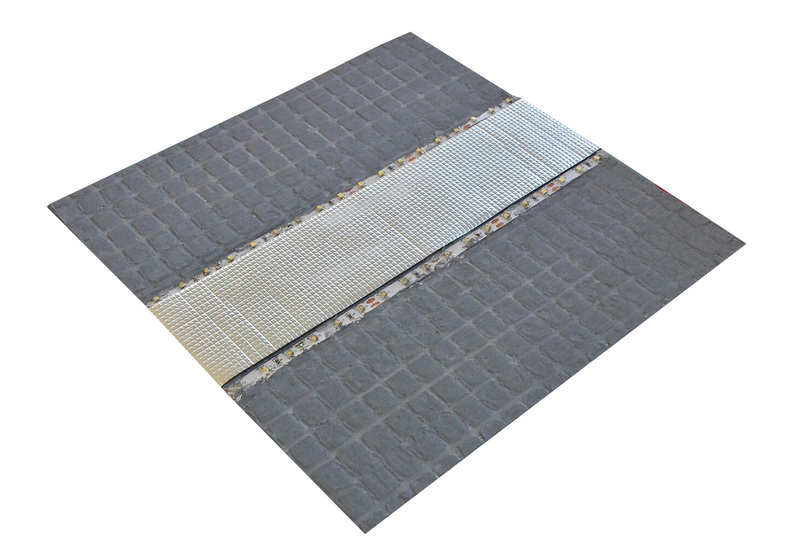 Roadsides are expanded; apart from dirt (magnetic), now three more types will be available: raised 1" sidewalks (magnetic), sloped 1/2" black/yellow caution hatch (magnetic) and the impressive 1/3" LED illuminated roadsides (non-magnetic). Everyone has a little Admiral inside... so how about some naval battles or coast landings? You can expand your battlefield with coastline tiles or open water ones. You can use them to create big lakes, or sea gulfs and coastlines. There is even a river delta tile, to connect your rivers to the open water. The Coastline tiles are further divided into 3 kinds: Straight beach, Concave coast (inwards turn), Convex Coast (outwards turn). They can be combined to recreate any coastline you want. The Coastline tiles have a zone of 10cm of beach, and the rest of the tile is open sea. That means that the Straigh beach tile is 33.3% land and 66.6% "water"
The Coastline tiles are not Flat. The "water" will be at 0cm (river water level), painted atop the 1mm plastic tile base. The land part will be mostly slope, starting at sea level and sloping gently upwards for the next 7cm of the tile, to reach the full 1cm height of regular tiles (the 7:1 grade is more than enough to keep miniatures from sliding). Then, the last 3 cm till the tile edge will be flat, and painted to the texture of the rest of the Set, to achieve transition. The River Delta acts as a straight beach tile, with the gap of a river mouth. There will be some texture (mud banks) at the point the river joins the open water. The open sea tiles will be completely flat, at 0cm (1mm). The sea will have small breaking waves, but nothing too protruding to allow miniature sliding. There is a liquid glass option for the Water parts, although it will be more rugged than the river tiles, and it requires much more effort and resin. 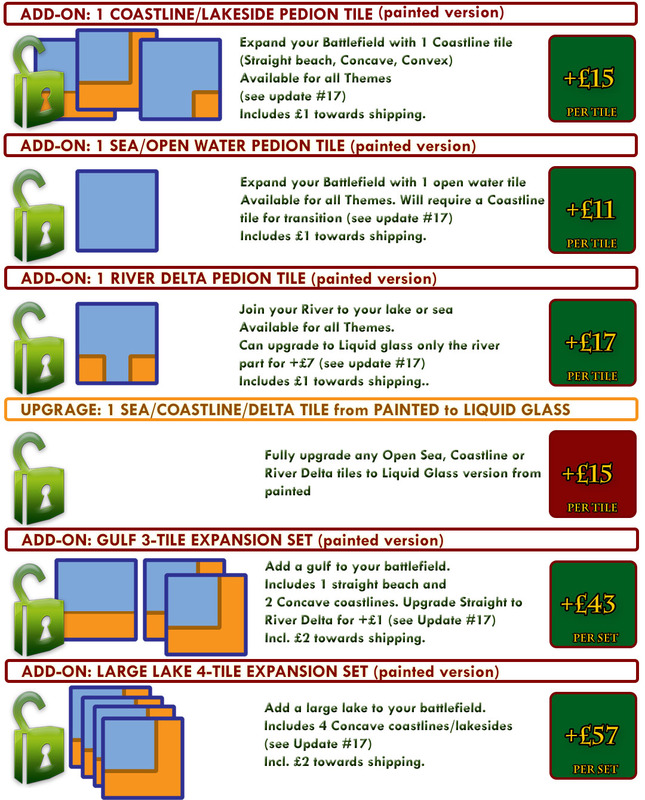 Also there is the option to upgrade to liquid glass only the River part of the Delta tile, and to create a smooth transition (through mud banks or pebbles) to the painted open sea. The "Water" can be exchanged for Lava or Green Toxic liquids. All Wall System Starter Sets get ONE MORE Stone Wall piece. Now let's see if we can reach the 180 backer limit and free tiles! only a few hours left for you to pledge!